Self-publishing is popular these days. There is Indie publishing through Amazon.com’s Kindle as well as several other e-book outlets. If you are considering self-publishing you might want to have a look at this Publisher’s Weekly article. one, you have one more thing to write: a query or a cover letter. Find your publisher’s submission guidelines and follow them to the letter. No matter how much you would like to see your work in a certain publication, if they tell you they only respond to agents, don’t submit to them unless you have an agent. If they tell you they do not publish first time authors, don’t submit to them unless you can reference another publication that has accepted your work. If submission guidelines have length restrictions, make sure your manuscript complies. 100k words or less is not 100k plus one and 50k words or more is not 49,999. If you are looking for an agent, follow the exact same procedure as you would in looking for a publisher. Cover letters and queries have some distinct differences. In writing your cover letter, don’t write “to whom it may concern." If all else fails, Dear Editor will do the trick, but you really are better off finding the name of the department head and sending your letter directly to them. Cover letters are generally for short submissions of poetry or prose and accompany your finished product. The cover letter presumes that the editor will read the enclosed materials. Queries are sent to trigger or determine a publisher's or literary agent's interest in longer works such as your manuscript, a non-fiction article or series of articles. Usually only a sample chapter, a few paragraphs, or perhaps, only an outline of your idea accompanies a query. The goal of the query letter is to persuade a literary agent or editor to read your enclosed samples and ultimately to request to see more of the work. Most important is to remember to always link what you say about yourself and your work to what is important about their publication. If it isn't important to their publication, it is not important for them to know. Written to help interns apply for jobs, a recent NPR article gives any writer some ideas of what not to write in a cover letter or query. "From South Beach to the Mediterranean, from Paleo to Atkins—today everyone is talking diet, but few are talking sustainable eating. 'Sustainable Diet' is a plan folks can live with for a lifetime. With sub-topics like Clean Plates Belong in the Cupboard and Don't Reduce, Substitute this article will tell your readers how to get there from here. It is similar in pace and length to 'Diet America' published in your July 2016 issue." Second, briefly introduce yourself. Don’t go through your complete portfolio and don’t give them a CV or a resume. You are not applying for a job. You are trying to sell your story. Stick to your goal. Maybe tell them what gave you the idea for your story, what your experience writing in their genre is, or some other bit of self-trivia. making sure that is links the value of your work to their publication. Finally, summarize your story without spoilers. Nobody wants to know the end in advance. Keep your letter short. The entire letter should be no more than one single-spaced page in an average sized, easily readable font. The objective of your letter is to show them that you and your work are a good fit for their publishing house. A good rule of thumb is not to submit your work simultaneously unless permission is given in the submission guidelines. If you do, you must tell editors that it is a simultaneous submission and if it is accepted elsewhere, you must withdraw it. "This story is a simultaneous submission. Upon acceptance, I will withdraw it immediately from all other sources." Finally, do not send the only copy of your work with expectations of getting it back. You may not. Even so, do enclose a self-addressed stamped envelope. 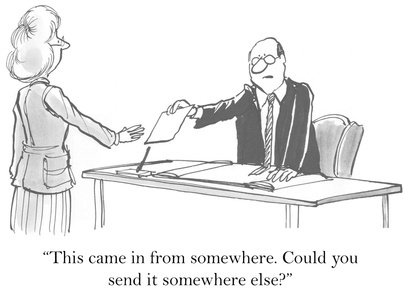 Although the publisher may not send back your work, enclosing an SASE will increase your chances of receiving a reply. Add the phrase "SASE Enclosed" under your signature. If you submit by email (and you should only do that if submission guidelines allow it) don't rely on the "reply" field. Be sure to add your email address under your signature.